For over 100 years, Balboa Park has served as San Diego's flagship public space. Its exquisite design features a plethora of attractions, which draw millions of San Diegans and visitors to the park each year. Northeast of downtown San Diego, adjacent to Interstate 5, and surrounded by the historic urbanized residential neighborhoods of Banker's Hill, Hillcrest, North Park, South Park, and Golden Hill. 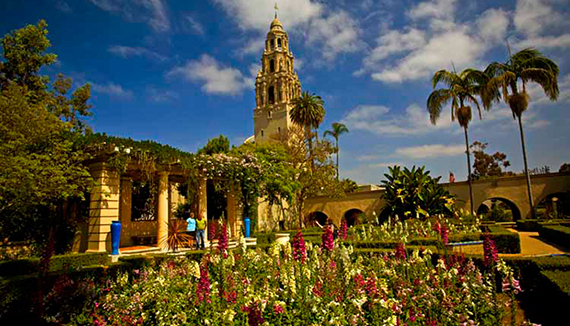 The California Tower is undoubtedly the focal feature of 1,200-acre Balboa Park. Completed in 1915 for the Panama-California Exhibition, the tower is seen here from Alcazar Garden, a public space modeled after the Alcazar Castle in Spain. Balboa Park boasts a wealth of plant species and ornate gathering places. Photo City of San Diego. Balboa Park is home to the world-famous San Diego Zoo; 15 major art, history, science, and sports museums; indoor and outdoor performance spaces; lush gardens; dog parks; trails; informal recreational spaces; and restaurants. Balboa Park is a complete destination in the central heart of San Diego that draws you in and makes you want to stay for the day. In 1868 San Diego civic leaders set aside 1,400 acres of land, known then as "City Park." For 20 years, the park remained without landscaping or development. In 1892 prominent horticulturist Kate Sessions, also known as the Mother of Balboa Park, started to make donations in the form of trees and shrubs. In exchange, she was to receive 32 acres of land within the park's boundaries to be used as her commercial nursery. In the early 1900s, a master plan for Park improvements and beautification was introduced, and in 1905 a new City tax supported Balboa Park's early development. The city installed water systems and built roads, allowing the park to develop into the multi-faceted urban park it is known as today. In 1915 the Panama-California Exposition was to be hosted by the City of San Diego, but it was felt that "City Park" was not a "distinctive-enough" name for the site of such prestigious event. A naming contest was held, eventually leading the park commissioners to choose the name Balboa Park in honor of Spanish-born Vasco Nunez de Balboa, the first European to sight the Pacific Ocean while exploring Panama. After the exposition, the U.S. Navy occupied portions of the park to train sailors during World War I. In fact, the park's iconic lily pond, located in front of the Botanical Building, was used to teach sailors to swim. While most of the buildings from the first exposition were designed and built to be temporary, San Diegans became attached to the park, and efforts were made to preserve the buildings. To help improve the local economy after the Great Depression, a second exposition was held in 1935. Like the first, the second was also extended for two years. Efforts to preserve the park's acreage and maintain historic resources are ongoing. Portions of the park are listed on the National Park Service's National Register of Historic Places, in the following areas of significance: architecture, art, education, landscape architecture, and sculpture. Many of the buildings constructed during the expositions were built with wood-lath construction. Some were destroyed by fire in the 1960s and have been rebuilt. There are also a number of Capital Improvement Projects (CIPs) that require significant investments. To help address the park's needs, the Balboa Park Conservancy was recently formed. The park presently consists of approximately 1,200 acres. Over the years schools, freeways, the San Diego Naval Medical Center (with 6,000 employees), and other uses have decreased its overall acreage. One prime example of the variety of spaces within Balboa Park is the Spreckels Organ Pavilion. This 100-year-old civic space has played host to concerts, movies, music lessons, ceremonies, and more over the years. Photo City of San Diego. What doesn't this century-old, magnificent park have? Balboa Park boasts an impressive collection of museums and institutions, and is beloved by locals and tourists alike. Balboa Park exemplifies the considerable traffic and allure that a large, urban park can achieve when a variety of uses are planned and maintained within the space as a whole. Within the 1,200-acre park, there is an incredible abundance of cultural institutions, museums, greenspaces, memorials, playgrounds, theaters, and more. Some prime examples include the San Diego Zoo, El Prado Promenade, Botanical Building, Old Globe Theater, and Spreckels Organ Pavilion, which provide venues for different uses such as concerts, education, and recreation. Balboa Park has a rich history that is closely tied to the history of San Diego as a whole. There are many precursors that helped turn Balboa into what it is today. In 1868, local civic leaders set aside the original 1,400-acre space to be used as a park. In the 1890s, beautification projects began under the leadership of Kate Sessions, dubbed "The Mother of Balboa Park." Then, in anticipation of the Panama-California exhibition, the city established the first official master plan for the park. The plan added water systems, roads, and Spanish Colonial architecture, and the exhibition was a smash hit. Since that time, Balboa Park has remained a major public space for locals and tourists alike. Planning has continued to guide the growth and maintenance of Balboa Park throughout the years. In 1960, a comprehensive plan was developed to address concerns about aging building infrastructure and encroaching land uses. As a result, the city moved to improve landscaping, modernize buildings, and upgrade pedestrian walkways. In 1989, a new master plan was approved to guide future development. The Balboa Park Events Calendar provides an in-depth listing of all the events in the park. Climb the California Tower: For the first time since 1935, visitors to the park have the opportunity to climb the iconic California Tower. 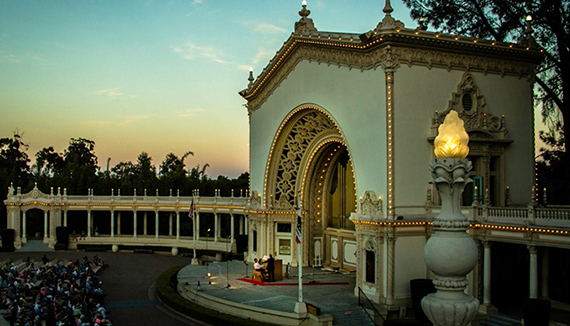 Organ Pavilion Concerts: Sundays, 2 p.m., at the Spreckels Organ Pavilion. Also live-streamed online. San Diego Invites the World: The 1915 Expo is an exposition that celebrates the centennial anniversary of Balboa Park, running from January 2015 to July 2016. It honors the legacy of the 1915 Panama-California Exposition that was hosted in Balboa Park. The EarthFair in Balboa Park is the largest free annual environmental fair in the world. It's been in existence more than 25 years and features more than 300 exhibitors ranging from governmental programs to commercial enterprises and conservation groups, all working to advance the protection of the environment and quality of life. There are activities for both kids and adults including a children's stage, an eHome exhibit that displays products and technologies to help make homes more sustainable, and a food pavilion that features vegetarian cuisine.